This fast-tailed minnow is the perfect Dropshotting lure. Can be worked fast or slow to suit the conditions. 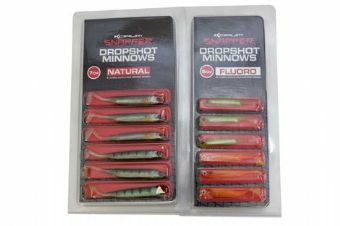 The inner ‘flash foil’ attracts fish quickly whilst the long slim body allows you to use a larger hook than most styles, much better when fishing venues with big fish. Available in three different types, in both 5cm and 7cm. OLIVE FRY - Looks like everything that swims, a devastating fry imitation pattern. GOLDEN PEPPER - The golden glitter gives this lure a real edge in coloured water. ROACH - This shimmering blue lure is a proven winner. The perfect roach imitation. PERCH - Perch are addicted to small perch. This striped pattern is great on hard venues. SPOTTED LIME - Arguably the best perch colour of all time. Fantastic for all venues. GOLDFISH - Has gained a massive cult following. Gets a reaction from all predators.